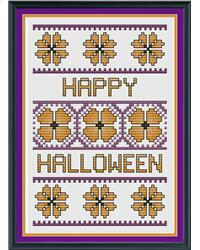 I present a pretty floral design to be stitched for making into a Halloween card. The finished design measures 53 by 79 stitches. If stitched on 16 count aida fabric, the finished measurements will be approximately 4” x 5” (10.5 x 13 cm). Your fabric should measure a minimum of 8” x 9” (20 x 23cm) to give a 2” (5cm) border around the outside. You can then cut the fabric around the design and mount it onto a card of your choice. I have designed this to be stitched onto 16 count aida in order to fit onto a 5”x7” greetings card blank. You can, of course, use a different count of fabric, 18 or 14 count, and your finished size will be different and you may need to use a different sized card and cut your fabric larger or smaller depending on your choice. There are seven colours in this design. Three shades of purple, three shades of orange, and black for the centres of the flowers. These colours are simply my suggestions, and you are welcome to change them if you wish to match your card choice. Different coloured fabrics would also work and make your cards really unique. All cross stitches are to be done with two strands of thread, and all backstitch in one strand.